We’d love your help. Let us know what’s wrong with this preview of Chloe Shipton & The Quill of LeFay by Lynn Veevers. To ask other readers questions about Chloe Shipton & The Quill of LeFay, please sign up. Chloe Shipton & The Quill of LeFay was a very interesting read. I really loved this story. I enjoyed the characters, the setting of the world, and the plot. The characterization of Chloe was one of the things I liked most about this novel. I immediately cared about Chloe and her story. She's a quiet, bookish student who can hear the thoughts of the living...and the dead. Many call her a freak and as a result she's often bullied and targeted by a particularly mean girl Lydia. We get a real se Chloe Shipton & The Quill of LeFay was a very interesting read. I really loved this story. I enjoyed the characters, the setting of the world, and the plot. The characterization of Chloe was one of the things I liked most about this novel. I immediately cared about Chloe and her story. She's a quiet, bookish student who can hear the thoughts of the living...and the dead. Many call her a freak and as a result she's often bullied and targeted by a particularly mean girl Lydia. We get a real sense of the struggles many school students endure so we feel a sense of sympathy and concern for Chloe right away. Throughout the story though, Chloe begins to come out of her shell and into herself, fostering lasting friendships, finding confidence, and growing as a student and sorceress. Chloe's friends are also portrayed in a likable light, each with their own unique personalities. The theme of friendship, overcoming fear, and unity come across strongly here, which gives Chloe Shipton & The Quill of LeFay a real feel-good element. Veevers does a great job of world-building so we get a real sense of the world Chloe lives in. We learn that the magical system in Chloe Shipton & The Quill of LeFay is very detailed, with its own governing factions, orders, and history. There are also other creatures in the story that keep it interesting and action packed, such as dragons and ice imps! The creativity of this novel is rich and thrilling, which adds to the experience. I have received an ARC of this beautiful book from Lynn. I wish I can give Chloe Shipton & The Quill of Lefay ten stars because this book will give you goosebumps that will last for hours. Chloe Shipton is the only one in her school to have the magical ability to read the minds of the alive and the dead. She’s a selfless and forgiving person that she follows the screams of her torturer. She was placed in a state of spirit entrapment because she was caught watching the mysterious ritual invol I have received an ARC of this beautiful book from Lynn. I wish I can give Chloe Shipton & The Quill of Lefay ten stars because this book will give you goosebumps that will last for hours. Chloe Shipton is the only one in her school to have the magical ability to read the minds of the alive and the dead. She’s a selfless and forgiving person that she follows the screams of her torturer. She was placed in a state of spirit entrapment because she was caught watching the mysterious ritual involving her torturer. Together with her friends, they will find ways to locate her body and bring her spirit back to the body. The introduction of the story is unique, and it already foreshadows that something mysterious and interesting will happen in the next chapters. The world of Grammaire is beyond one’s imagination; it is full of mystery that you want to unlock. The edicts and orders are all interesting and different that you will wish you will be part of any order. I just wish there’s a chart on the first page of the different edicts with all the orders. Lynn builds all of her characters perfectly where you can see the development of all of them in just one book. The conflict of the story is really interesting, and it ties all of the chapters together. The ending is unexpected, and it can make you cry. Recieved ARC from the author. Firstly I like the concept of the cover artwork, at first glance I thought it was a curtain, then I saw the figure. I quite enjoyed this one, Chloe the studious 15yr old is mature, selfless despite all she’s been through and I’d say naive. The story starts off well, the thing that surprised me the most was the girl had to almost die before the boy noticed her. Apart from the obvious, the story is based on friendship and magic, there’s an abundance of both. Good desc Recieved ARC from the author. Firstly I like the concept of the cover artwork, at first glance I thought it was a curtain, then I saw the figure. I quite enjoyed this one, Chloe the studious 15yr old is mature, selfless despite all she’s been through and I’d say naive. The story starts off well, the thing that surprised me the most was the girl had to almost die before the boy noticed her. Apart from the obvious, the story is based on friendship and magic, there’s an abundance of both. Good descriptive writing painting the scene. I think I would definitely choose cogitari, who wouldn’t want to read minds. I like the familiars and how they range on a scale of common to mythical. Why spiders? It’s always spiders (yep i’m terrified of them). The plot is good and even, the pace of the story is smooth. I found from chapter thirty one? Things started unwinding a little with the time skip and the trials felt like a filler. The transition could be a little smoother but it was all good. Chloe Shipton & the Quill of Lipton LeFay is a very well written book by Lynn Veevers. This book reminded me a little bit of Harry Potter but had a different feel to it. Yes it was set in a boarding school of sorts that teaches children how to use their magical gifts, but in this case the children were divided based on their gifts. Just like in your average highschool however, they form cliques and apparently even these kids are not above bullying. As I said, the fact it was a boarding schoo Chloe Shipton & the Quill of Lipton LeFay is a very well written book by Lynn Veevers. This book reminded me a little bit of Harry Potter but had a different feel to it. Yes it was set in a boarding school of sorts that teaches children how to use their magical gifts, but in this case the children were divided based on their gifts. Just like in your average highschool however, they form cliques and apparently even these kids are not above bullying. As I said, the fact it was a boarding school teaching children how to use their gifts, was the connection to Harry Potter, but when I read it, it just had a completely different feel, probably because for a good part of the book our main character was spiritually entrapped, meaning she was basically a ghost. So let's talk about Chloe, oh man did I like her! She is your somewhat typical outcast in school who thankfully found the one friend in school that she can rely on no matter what! Little did she know when actually had a few more friends than she thought! There are some really great characters besides Chloe in this book and I really enjoyed the character development the author did, especially the transformation Chloe was pretty much forced to go through due to her ordeal! The plot in this book was very well developed and I really enjoyed it. It is your "whose done it" sort of mystery and it really had me going for a long time, who am I kidding I didn't figure it out and pretty much had it explained to me all the way, well all but one part really. There are some great twists in there that tied it nicely with some well known magicians of old which I also found put a nice spin on this story. I have a weakness for all things magic related and Lynn Veevers has created an extremely interesting world that combines common lore and mythology with multiple styles of how magic can be perceived. I'm really interested to see how this world grows from here as well as delve deeper into its history. Grammaire is basically like Hogwarts meets Charmed with a dash of medieval times. There are two sects of magic that house many different types of sorcerers and sorceresses, everything from elemental m I have a weakness for all things magic related and Lynn Veevers has created an extremely interesting world that combines common lore and mythology with multiple styles of how magic can be perceived. I'm really interested to see how this world grows from here as well as delve deeper into its history. This story almost feels like two books in one. We start off with Chloe, our almost too selfless protagonist, finding herself with a bad case of the wrong place, wrong time blues. Yet, when she finally comes to a week later, her body is nowhere to be found and she's stuck between the planes of the living and the not so much. But, thankfully there is magic in this world and her three friends to help her figure out what the actual hell happened to her. For teenagers, these guys are smart and quick as a whip. If one of my friends rolled up on me sleeping as a spirit, Merlin knows I'd still be sitting there screaming and freaking out. The second half of the book picks up after a small pause in the storyline and almost reads like an extended novella before almost ripping my poor heart from my chest with a small twist in the last chapter. Without giving so much away, let's just say I'm very fond of the twins. Very. Fond. oH God! Dear Lynn you did it again. Being a part of the ARC team is the best thing that happened to me in a while, I recieved this amazing book couple days ago though I noticed it in my mail box last night but I don't know how but I read it, all of it. A fifteen years old Chloe Shipton a student of thought belonged to the Order of Cogitari. One day in a sudden Chloe disappears, her spirit separates from her body, and Chloe spirit wakes up in the campus graveyard while she couldn't remember what oH God! Dear Lynn you did it again. Being a part of the ARC team is the best thing that happened to me in a while, I recieved this amazing book couple days ago though I noticed it in my mail box last night but I don't know how but I read it, all of it. A fifteen years old Chloe Shipton a student of thought belonged to the Order of Cogitari. One day in a sudden Chloe disappears, her spirit separates from her body, and Chloe spirit wakes up in the campus graveyard while she couldn't remember what happened to her nor that she is just a spirit that walking around. In attempt to help her, her roommate and others who become like a family to her will do their best to find her body and solve that mysterious things that happens in the Grammaire Hall. I am so in love with the process of the events, I couldn't put my laptop aside because all I wanted to know WHAT WILL HAPPEN NEXT? And for sure I cannot wait to read the next book from this book series. I am surprised I liked it as much as I did. I am not normally one who goes for school-based magic fantasy books. Just not one of my go-to genres. With that being said, I actually liked this story, it was so different and so well told. It wasn’t overly predictable either. The relationships were really well done, they felt real and normal. They weren’t forced, plus the side characters were all multi-layers. Which just added so much more to the story. I also found the relationship between the studen I am surprised I liked it as much as I did. I am not normally one who goes for school-based magic fantasy books. Just not one of my go-to genres. With that being said, I actually liked this story, it was so different and so well told. It wasn’t overly predictable either. The relationships were really well done, they felt real and normal. They weren’t forced, plus the side characters were all multi-layers. Which just added so much more to the story. I also found the relationship between the students and the teachers refreshing. There was respect there, the Grand Dean especially didn’t treat them as idiots. He gave them respect, listened and give advice like he was talking to an adult. The youngest is 15. A wonderful tale; dragons, magic, and a school for children of magic. Young Chloe faces evil at her school of magic. Being separated from her body is a horrible fate. One her friends seek to save her from. Along with magic, dragons, master sorcerer's they uncover a plot that threatens not only the magic community, but normal humans. An exciting read. I enjoyed this immensely. I was excited to read Chloe Shipton and the Quill of LeFey because I'm a pretty big fan of books set in magical schools. The downfall with this genre is that I automatically compare all books to the world of Hogwarts. It just can't be helped. That means my standards are pretty high, but exploring the magical worlds other authors create is always fun and interesting. Lynn Veevers takes us to Grammaire Hall with this book, a school of sorcery in the Swiss Alps. It is there that we meet Chloe, the m I was excited to read Chloe Shipton and the Quill of LeFey because I'm a pretty big fan of books set in magical schools. The downfall with this genre is that I automatically compare all books to the world of Hogwarts. It just can't be helped. That means my standards are pretty high, but exploring the magical worlds other authors create is always fun and interesting. Lynn Veevers takes us to Grammaire Hall with this book, a school of sorcery in the Swiss Alps. It is there that we meet Chloe, the main character who has just experienced a rather unfortunate event. She’s witnessed her bully suffer a brutal fate while having her own soul knocked out of her body. She awakens with no recollection of the event, and together with her friends must figure out where her body is and what nefarious plans are being made before it’s too late. Overall, I thought the book was good. It is a short book at 157 pages, so a lot of story was pushed into the pages, leaving some (maybe helpful) backstory and details out. I didn’t really connect with Chloe, and although we are told time and time again that she is a kind and compassionate girl, I didn’t really get that vibe from her. Her personality didn’t shine through in the pages and I was left with a ‘meh’ feeling about her at the end. I liked the cast of characters around her, especially Zanthus and Alvars. I thought Chloe’s friend and roommate, Sophie, was an interesting character and I wish her background, talents, and even Sir Vincent, had been given more pages. The twins, Dillon and Devon, rounded out the sleuthing team and they were just alright for me. I think Dillon was a better character (why aren’t we reading about his awesome magical capabilities?! ), but Devon was given more of the spotlight due to his connection with Chloe.I liked the pacing of the book for the most part, but at the end it felt rushed. Huge gaps in time were skipped over, the climax falls a bit flat, and then the book ends. It sets up for a sequel/series, but I felt that SO much more could have been covered in this book to give the characters, setting, and story more depth. A bright spot of the book is how it ties in the famous Merlin and Morgana. I thought the author found a very creative and unique way to create a bridge between them and the characters in the book. 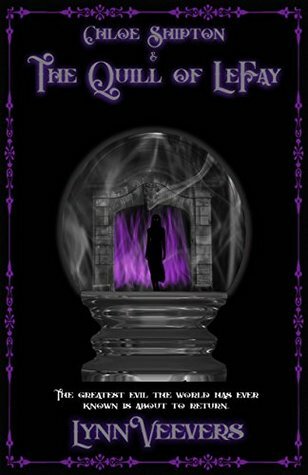 This is a book that would definitely appeal to YA readers who love magic, spells, sorcery, and adventure. The underlying themes of bullying, choosing kindness and compassion, and believing in oneself would make this a relatable book for any teen reader.